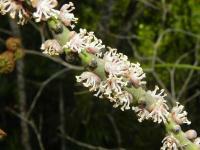 Dolichokentia robusta (Brongn.) Becc. • Cyphokentia robusta Brongn. 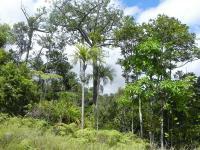 Cyphokentia macrostachya is a solitary, understory to canopy tree palm tree with a disjointed distribution in south and central part of Grande Terre in New Caledonia. Cyphokentia macrostachya occurs in wet forests on soils derived from either schistose or ultramafic rocks from 170-800m asl. In the south, C. macrostachya is very abundant in Parc de la Rivière Bleue where it the dominant palm species in primary forest at 150-200m asl. With an extent of occurrence and area of occupancy respectively equal to 5,544 and 68 km² and the fact that big populations occur in protected areas, Cyphokentia macrostachya qualifies as Least Concern (LC). Cyphokentia macrostachya is an endemic palm tree with a disjunct distribution in south and central Grande Terre in New Caledonia. Population size is not precisely known but census report of the population found that it is the dominant species in in Parc de la Rivière Bleue (a protected area) in the south. Cyphokentia macrostachya occurs in wet forests on soils derived from either schistose or ultramafic rocks from 170-800m asl. The species does not seem to be globally threatened although some sub-populations may be impacted by invasive species: seed and seedlings destruction by rats and rusa deer (Rusa timorensis), habitat damage by pigs. Cyphokentia macrotachya is protected by legislation in Province Nord and Province Sud. C.macrostachya occurs in four protected areas : Parc de la Rivière Bleue, Aoupinié, Parc des Grandes Fougères, Foret Nord.